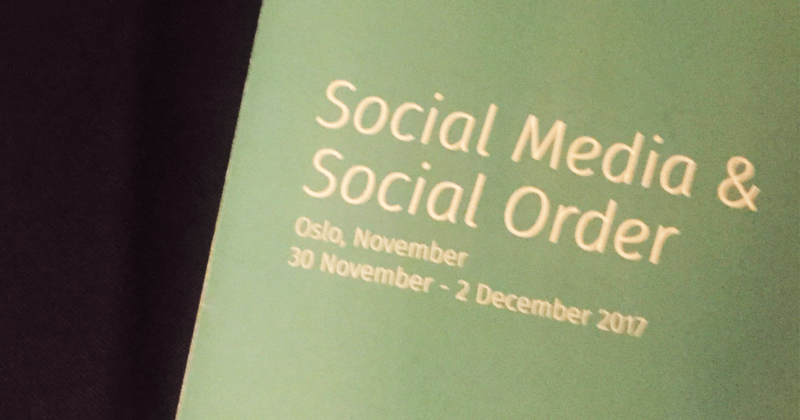 In his speech, celebrated Norwegian sociologist Knut Lundby said, “We must be careful not to exaggerate the power of social media in determining social order.” Despite the extreme respect for him in the field, Lundby’s warning was answered by laughter from the crowd: in a conference focused on social media and social order, this is awfully hard to do. Thanks to the Tufts Undergraduate Research Fund and the Institute for Global Leadership, I was fortunate enough to attend and present research I have been doing with Professor Sarah Sobieraj at the Social Media and Social Order conference in Oslo, Norway. Studded with acclaimed researchers, sociologists, and academics from a range of countries, we heard about projects ranging from the impact of meme collectives in Assam, India to Instagram appropriation in Norway’s Bible Belt; from the threat of Surveillance Capitalism to the empowerment of Palestinian rebels through the use of film and social media publication. The research that Professor Sobieraj and I presented was based on digital hate in the political world. We have been looking at the Twitter responses to US legislators based on their identities. A fair amount of research on identity-based digital hate has already been done, but from our findings, none has been done with an intersectional look exclusively at politicians. This originality, coupled with the increased polarization and identity-focus of American politics today, makes us very excited to continue with this work. As expected, based on our preliminary research, we have found that female politicians and politicians of color face far greater levels of hate and identity-based disrespect in their Twitter presences. Though we only presented our preliminary findings, the research was received well by the conference attendees. The ability to get feedback and suggested materials and methods from such acclaimed professionals in the field will undoubtedly help as we continue to pursue this research and improve our paper. The diversity and consistency of the works presented, coupled with social media’s seemingly ubiquitous nature, is perhaps why Lundby’s wise warning elicited guffaws in the crowd. It is hard not to feel the omnipotence of social media when digital threats can impose real fear or real harm, when it can track and tell you what you want before you know you want it, when it can bring together activists to fight for what they believe in, when it can stir political rebellions around the world.